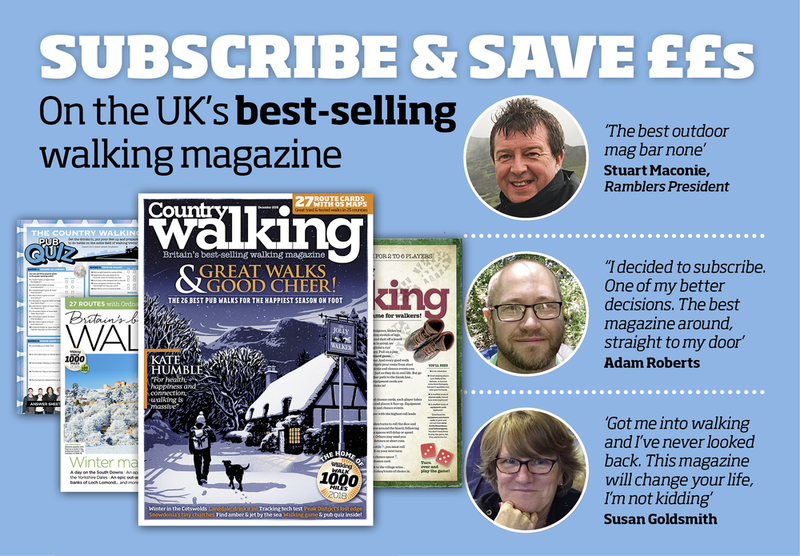 Country Walking is the biggest-selling outdoors magazine in the UK – 30 years young and as Ramblers President Stuart Maconie describes it ‘The best outdoor mag bar none’. Every issue of Country Walking brings you a handmade package of award-winning features, photography and routes completely dedicated to help you make the most of the greatest pastime on earth. Our 27 route cards build into a library of adventures all over the country, and provide you with endless help and inspiration toward your 1000 miles. And there’s tons of chances for you to appear in print too! That's why CW is one of the fastest-growing magazines in the country – and there's never been a better time to join the club. Subscribe to Country Walking – the UK's best-selling and fastest-growing outdoors magazine, and the official #walk1000miles companion – and you get it for a fraction of the shop price, and half-price premium access to OS Maps – giving you every Ordnance Survey map on your phone, tablet and computer; unbelievably great value half price for a year. 13 issues of the UK’s best-selling and fastest-growing outdoors magazine and the home of #walk1000miles.